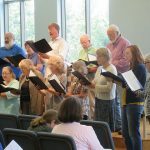 The UUC choir welcomes anyone who loves to sing! Auditions are not required. Rehearsals, under the direction of Ella Kromin with pianist Jared Gibbs, are every Wednesday evening mid-August to mid-June, 7:00 to 8:30 p.m. in the sanctuary. The choir typically sings on the first and third Sundays of the month. On those Sundays, the choir meets at 9:15 a.m. to warm up. The Children’s Choir, known as the Chalice Choir, is under the direction of Ella Kromin and is open to all young singers in grades 3-8. Rehearsals are weekly on Wednesdays mid-August through May from 6-6:45 PM. Performances are approximately once a month. Come, join us! Singing makes the world go round. Sign up online at https://goo.gl/forms/DTAVjsyPBuki9Dsm1. Throughout the year, individual members and guests provide special music during Sunday services for the prelude, offertory, or postlude. This may include singing or playing an instrument. Several of our youngest members have made their musical debuts with us. To provide music for a service, contact Jared.